Thousands of evacuees have returned to parts of California devastated by wildfires - some finding their homes no more than smouldering heaps. Fire crews have been gradually bringing many of the blazes under control. But more than a million people were evacuated and, for some, the threat to their homes has not yet passed. 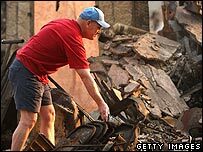 After flying over the devastated area, US President George W Bush said the federal government would provide every help to victims of the fires. Touching down in Escondido, California, Mr Bush said: "We're not going to forget you in Washington DC. "We want the people to know there's a better day ahead. Your life may look dismal today, but tomorrow life's going to be better. And to the extent that the federal government can help you, we will do so." The number of properties destroyed had risen to nearly 1,600 by Thursday, the office of California's governor said. While, in the Los Angeles area, many wildfires were almost out, in Orange and San Diego counties firefighters were still battling to get on top of the flames. Evacuation orders were still being issued and 16,000 homes were in the path of two wildfires that were still out of control, fire officials told the Associated Press. Vietnam veteran Steve Conner, 62, was allowed to return to his home in suburban San Diego, but described his reaction on confronting the scene as "total breakdown". "Emotionally, it was just beyond belief," he told Reuters. "It's just totally wiped out. All the trees are black... It just reminded me of Vietnam. It just reminded me of a war zone." As many people were allowed home, an American football stadium in San Diego, which once housed 10,000 evacuees, was being closed. And the human cost was still being revealed, as fire and search teams worked through burned-out homes and forests. Border patrol agents found the charred bodies of four people - thought to be three men and a woman - near Barrett Junction on the Mexican border. The area is near a major corridor for illegal immigrants crossing from Mexico. Officials said it was not clear, however, whether they had been killed by the fires or were already dead when the rocky ravine went up in flames. Earlier, a San Diego fire department spokesman told the BBC that 10 people had died because of the fires, at least some of which are suspected to have been started by arsonists. They included a couple whose bodies were found burned in a home in San Diego County. At least 60 people were reported to have been injured, including a number of firefighters. 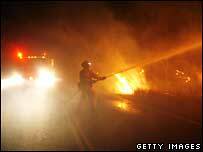 The firestorm has ravaged at least 760 sq miles (1,970 sq km) of land from Santa Barbara down to the Mexican border. But the high winds that spread the fires so rapidly have died down, the weather was more favourable, and fire chiefs said they had "turned the corner". Maurice Luque, spokesman for the San Diego fire department, said: "There's no Santa Ana winds. The weather has turned a little more calm, the humidity is up, the temperatures are down a little bit in some areas." The fires, which broke out last weekend, have forced one million people from their homes in the biggest US evacuation since Hurricane Katrina two years ago. Mr Bush was heavily criticised for the federal government's sluggish response to that disaster and analysts say he is keen to avoid repeating the mistake. He praised the efforts of the emergency services and California's Governor, Arnold Schwarzenegger, while also seeming to take a dig at the authorities in Louisiana, which bore the brunt of Katrina.